If you are a fan of pumpkin pie, then you must try pumpkin butter! It has all of the cinnamon, nutmeg, and spice-filled flavors of the traditional pie without any of the fat. I picked up the butter on my last trip to Trader Joe’s and have been consistently using it ever since. I particularly liked the Trader Joe’s brand because it has a mere 5 simple ingredients. It’s sweet like pie, but doesn’t have any more sugar than a corresponding fruit jelly would. 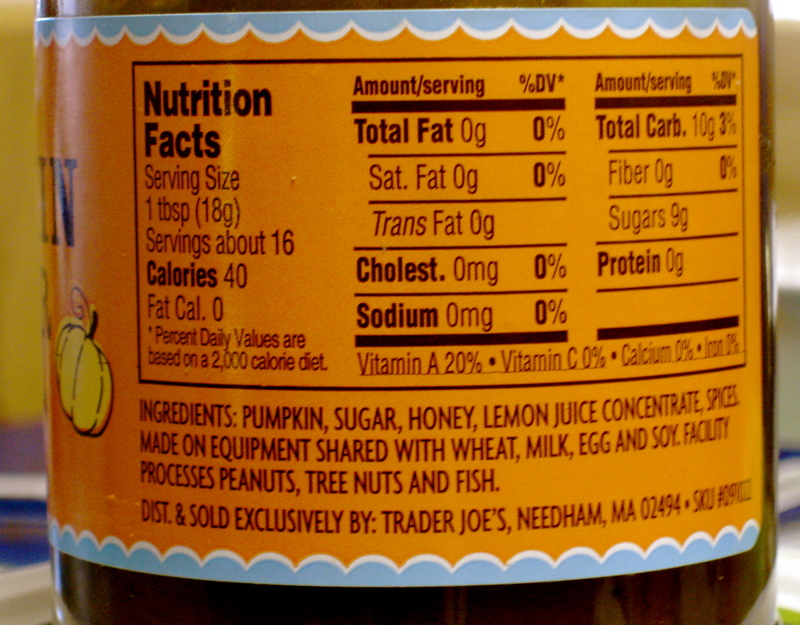 The pumpkin butter contains 9 grams of sugar per tablespoon. Not too shabby. This is definitely less than most sugary breakfast cereals. Plus, one serving has 20% of the daily recommended serving of vitamin A. I don’t know of too many jellies than can offer that. 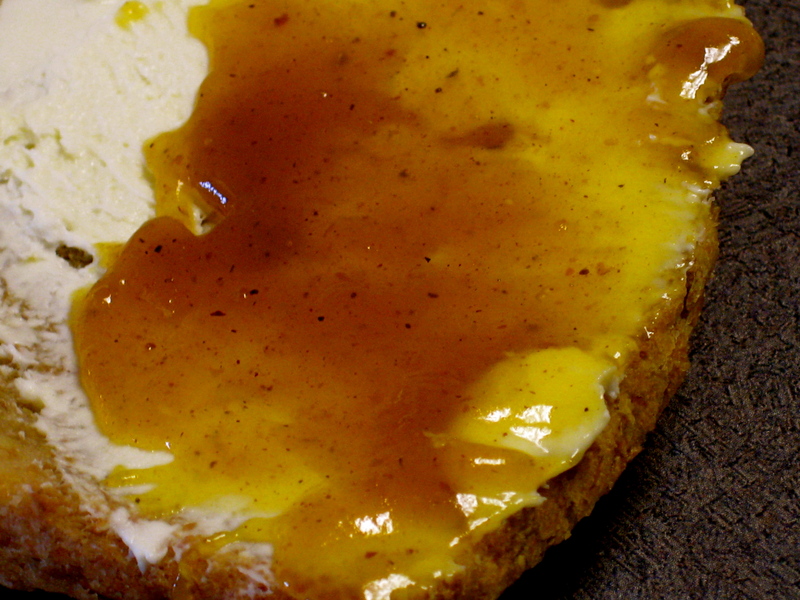 The butter is pretty versatile and can replace any item where you would normally use jelly. For instance, it pairs nicely with peanut butter, either on bread or crackers. I’ve also been enjoying swirling it into both my morning bowls of oatmeal and yogurt. When combined with low-fat cream cheese, this makes a delicious and unique spread for toast. Pumpkin butter is a nice sweet, smooth treat that will fill your taste buds with the spirit of fall. And who knows, maybe it will even spawn you to make your own homemade pumpkin pie. Hi. I discovered your blog and its nice. Pumpkin butter is great. I use it anywhere I would use applesauce or apple butter. Sounds delicious. I just can’t spend the money on it. 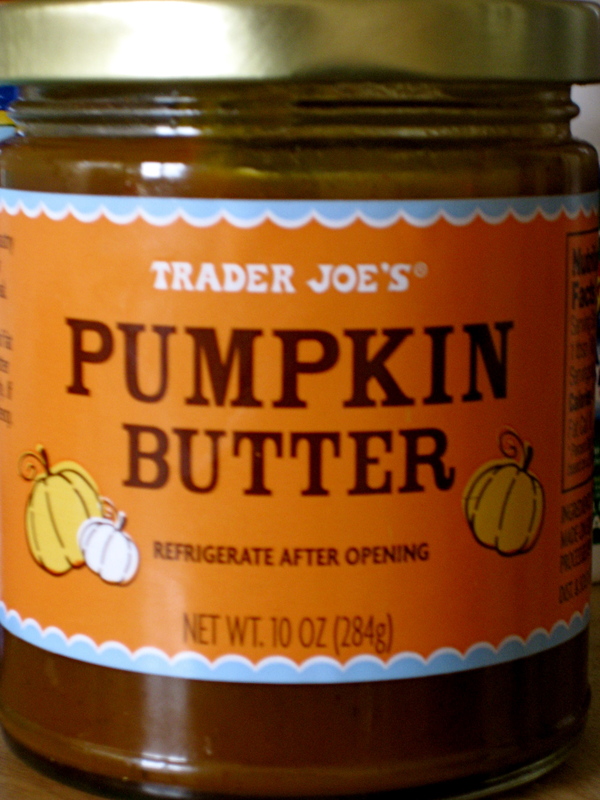 It’s about 4 dollars at Trader Joe’s and I guess I’d rather buy almond butter, and canned pumpkin and mix it together! If Nick would eat it I may feel better buying it, but he wouldn’t. We’ll see, maybe I’ll splurge one of these days because everyone raves about it! I’m feeling a pumpking muffin/cupcake in the works with a frosting of whipped cream cheese/pumpkin butter. Or maybe a topping for oatmeal too! This surely makes great sense to me! !